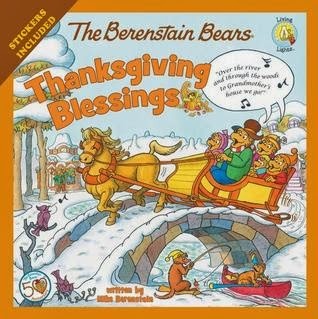 Gear up for Thanksgiving with this darling Berenstain Bear Book! The Berenstain Bears Thanksgiving Blessings Ride along with the Bear family on Thanksgiving Day as Brother and Sister learn about all the things they---and YOU---can be thankful for ... including faith, family, and the huge feast waiting for them at the end of their journey to Gramp's and Gran's. Includes a sheet of colorful stickers featuring the whole Bear family. The stickers were a extra fun surprise and we enjoyed the book. I know we will be reading it several times as we approach the upcoming celebration of Thanksgiving.